Applications are invited from the intending candidates (Indian Citizen) for filling up of the following two posts in the office of the District Sessions Judge Dibrugarh. The candidates must have the qualification/ eligibility criteria as shown below. The last date of application is 16th February, 2016. Educational Qualification: Matriculation or equivalent from a recognized Board/ University. Educational Qualification: Class VIII Standard passed. Age: 18 to 38 years as on 01.01.2016. Age relaxation is available in case of SC/ST/OBC etc as per norms. Standard forms as prescribed by the Govt. of Assam must be used. Two passport size photographs duly attested to be pasted. Self Attested copies of educational certificate and other certificates must be submitted along with the application. No calling letter/ admit card will be issued to the candidates. 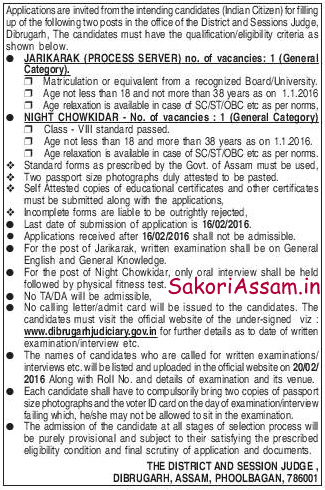 The candidates must visit the official website of the District and Session Judge, Dibrugarh, Assam viz: www.dibrugarhjudiciary.gov.in for further details as to date of written examination/ interview etc. Each candidate shall have to compulsory bring two copies of passport size photographs and the voter ID card on the day of examination/ interview failing which, he/she may not be allowed to sit in the examination. The admission of the candidate at all stage of selection process will be purely provisional and subject to their satisfying the prescribed eligibility condition and final scrutiny of the application and documents.